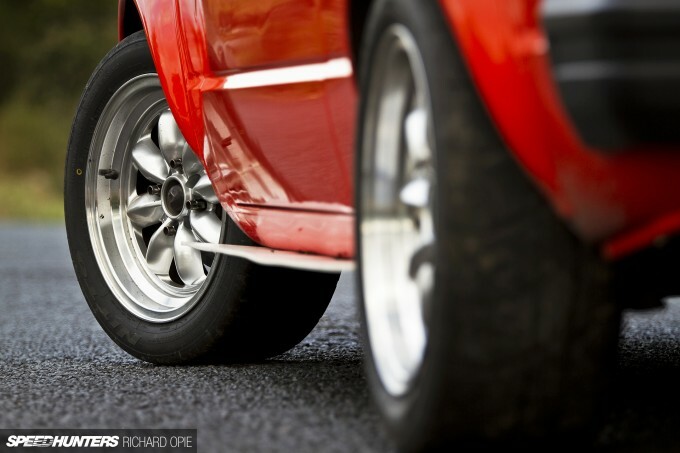 Meeting a fellow enthusiast for your chosen make, model or even style of modified car is rarely an unrewarding experience. Swapping war stories about that time you very nearly came to grief in a ditch due to the particular handling nuances of your mutually preferred steed, and comparing ideas and methods of personalisation and modification just never really gets old when you’re engrossed in conversation with a kindred spirit. 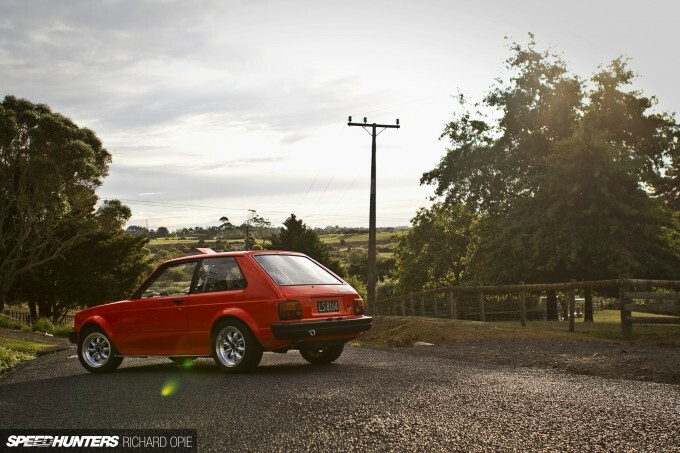 Upon dropping off some parts of my own KP61 Toyota Starlet project for a touch of vapour blasting, I was privileged enough to meet Kevin Sanderson, who was more than happy to allow a shoot and talk me through his very unique KP61 Toyota Starlet build with an infectious enthusiasm, in that typically proud-but-humble Kiwi fashion. 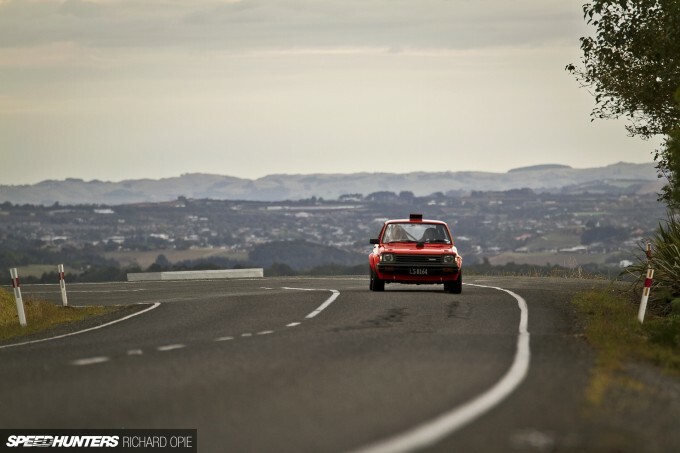 Before we detail this build it’s worth noting Kevin’s history in motorsport – starting in a Holden Torana XU1 circa 1974 on gravel, before building a VW Beetle featuring Corvair flat-six motivation which was a two-time winner of the Auckland (NZ) Hillclimb championship in his capable hands. 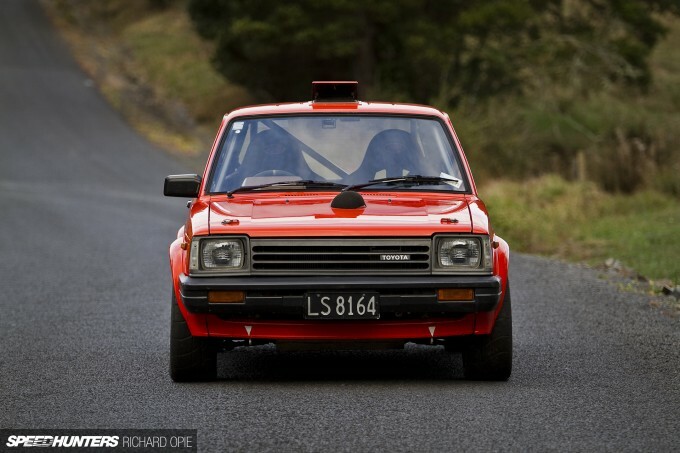 Following a 285hp works FJ24-engined Nissan Sunny, Kevin progressed to working alongside the late Kiwi rally legend Possum Bourne, engineering everything from Group N to WRC-spec Subaru rally machinery until ultimately taking over the reins of the Possum Bourne Motorsport business until 2010. 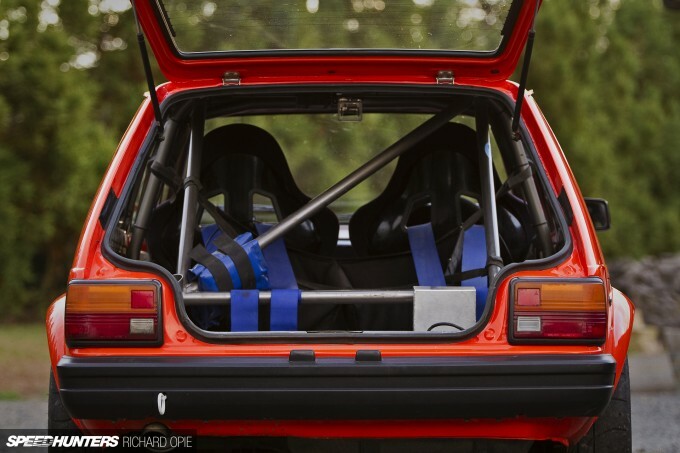 So it’s safe to say he knows a thing or two about building a capable racecar, and furthermore, making it work. 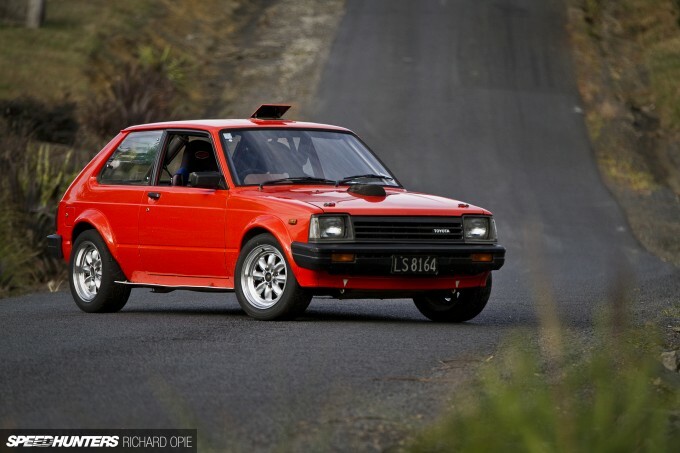 The KP Starlet chapter began in 2006, when Kevin’s youngest son Michael purchased an orange KP60 Starlet running the perennial Toyota 5K pushrod lump. 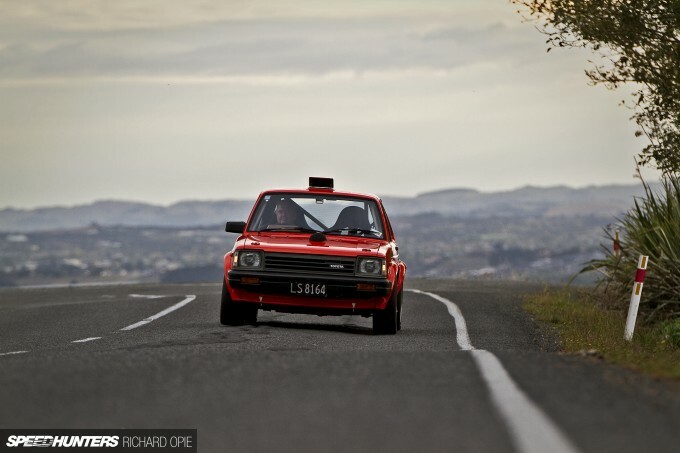 With a respectable 128hp at 7,200rpm on tap courtesy of Kevin’s racecar preparation experience, the father and son team campaigned the car across a variety of hillclimbs and rally sprints until an incident involving Kevin, the Starlet and a ditch put paid to the early incarnation. 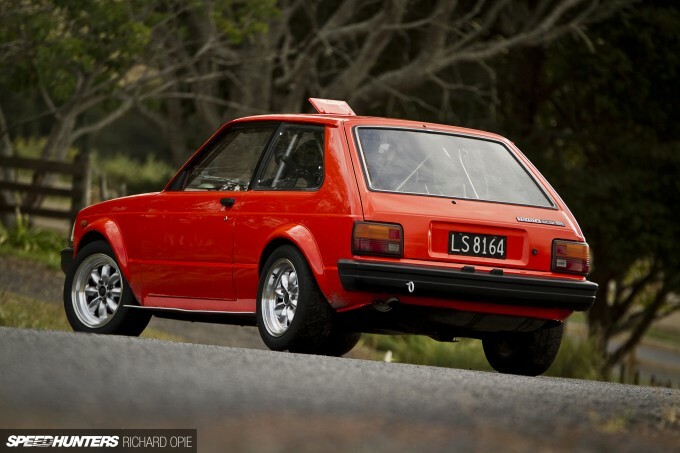 This prompted a re-shell into the ‘drophatch’ style KP61 shell the pair run today – a genuine ‘lady-owned-and-only-driven-to-the-shops-on-Sunday’ example ripe for transformation into a weekend warrior. 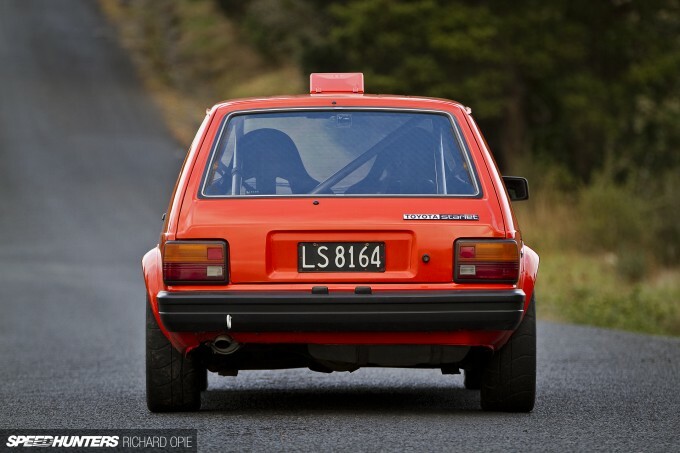 Swathed in the same orange hue that adorned Michael’s deceased KP, the reincarnated hatchback commenced its competition life in a very similar guise with the same 5K powerplant, suspension and wheels encased within stock bodylines. 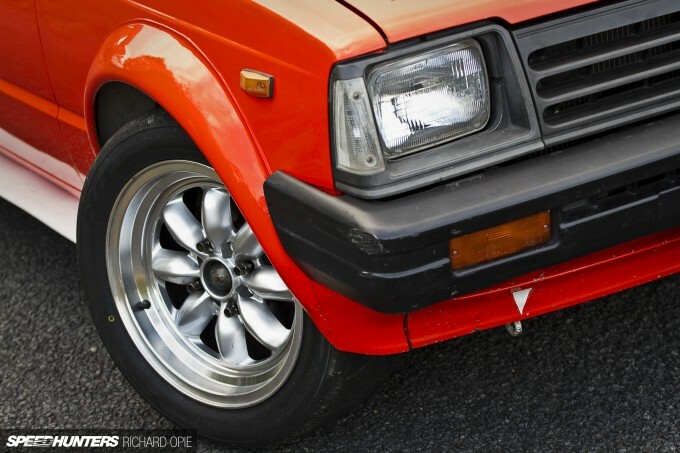 Following a year-long rebuild in recent times, outwardly there are clues to some changes in the Starlet’s underpinnings, starting with the flared arches courtesy of serial hi-po KP Starlet tinkerers Peltonen Motorsport in Finland. As happens with competition cars and their inevitable development, the Sandersons eventually began searching for more power. 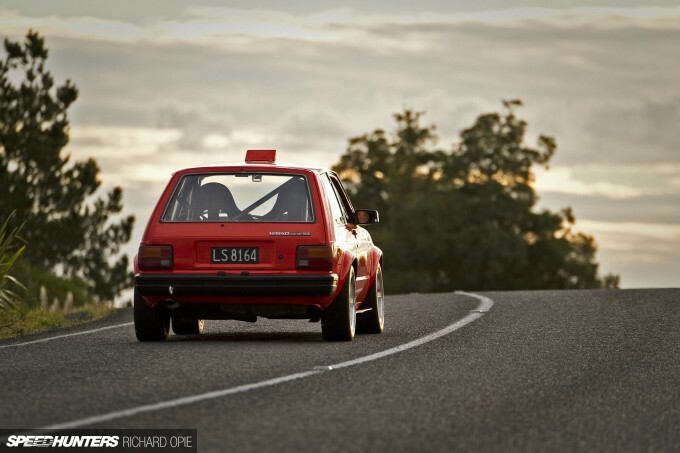 The 128hp provided by the pushrod engine was still competitive, but the yearning for more set in and options began to be explored. Finland again provided the initial inspiration for a power increase, with tuned Toyota K-series engines still very much in vogue among class rallying and churning out power levels in the 185hp region. The age old calculation of cost versus reliability kicked in, and with an estimated cost of between $15,000 and $18,000 dollars this option was eschewed due to fears that the 40-year-old design would become a hand grenade at such high power levels. The much smarter option? None other than the 1,340cc, DOHC inline four originally found slung beneath the alloy frame rails of a Suzuki GSX1300R Hayabusa sportbike. 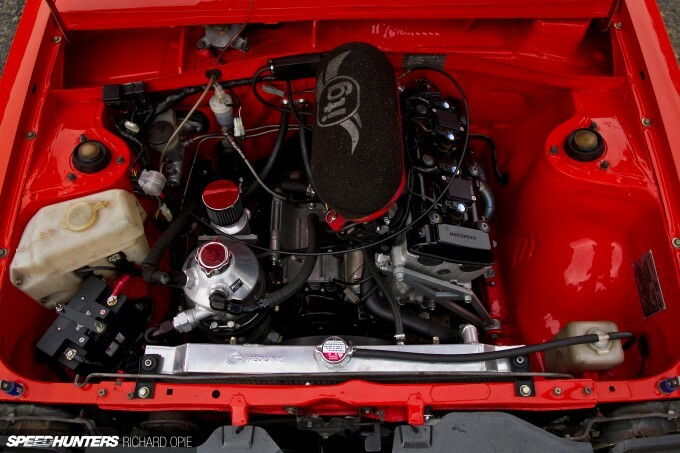 Offering compact, lightweight packaging and 173hp at north of 9,500rpm, the engine appeared destined to nestle between the struts of the lightweight rear-wheel drive KP61. 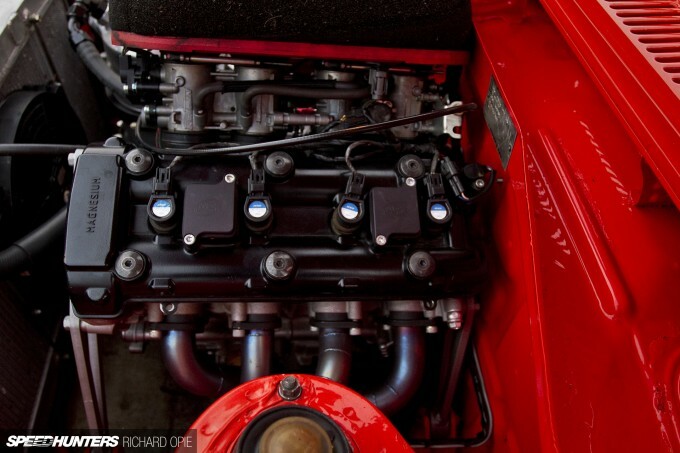 Mounting the engine in the bay becomes straightforward when, like Michael, you’re a draughtsman with a keen ability to turn design into reality. Using CAD software, bespoke engine mounts were drawn up then laser-cut, keeping the engine secure in the Starlet’s tiny engine bay. 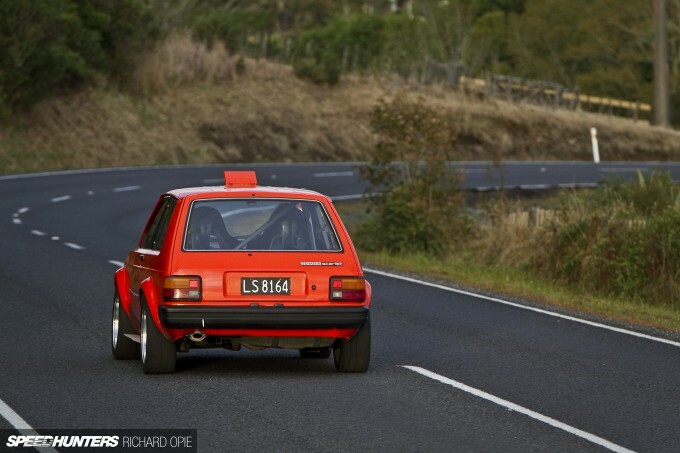 A handful of sensible modifications were made in the interests of reliability. 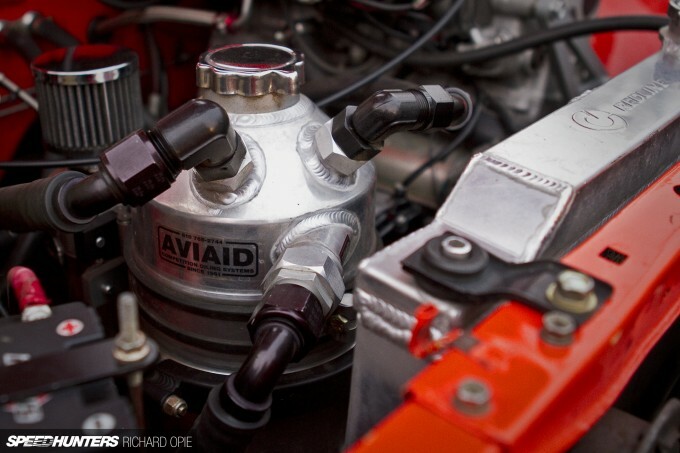 Firstly, an SDB dry sump system pumping into a custom Aviaid reservoir keeps the high-revving mill properly oiled and eliminates any oil surge associated with the change of orientation compared to its motorcycle installation. Beneath the head lie 16 OEM-sized stainless steel Kibblewhite valves, alleviating any possible issue with the stock stainless items which are a known weak point with intensive use. Finally, with the knowledge the engine would spend most of its days spinning above 7,500rpm, Kevin added a set of Wossner H-beam rods for complete peace of mind. 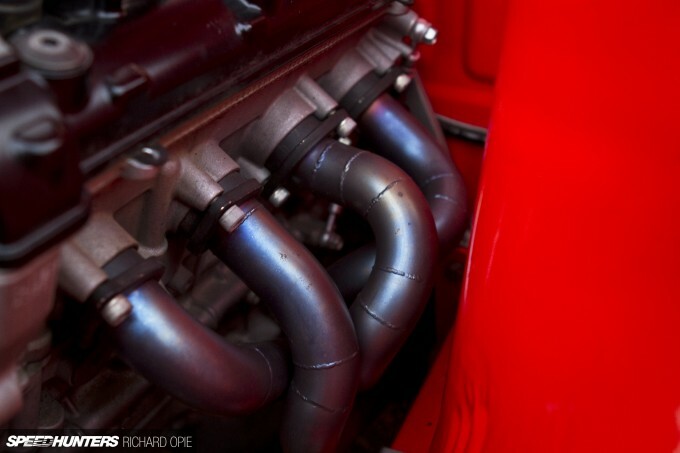 A custom set of 304 stainless 4-1 headers take care of exhaust duties, directing spent gases into a 2.125-inch stainless exhaust and endowing the car with a distinctive howl that resonates among the rolling hills it regularly competes amongst. 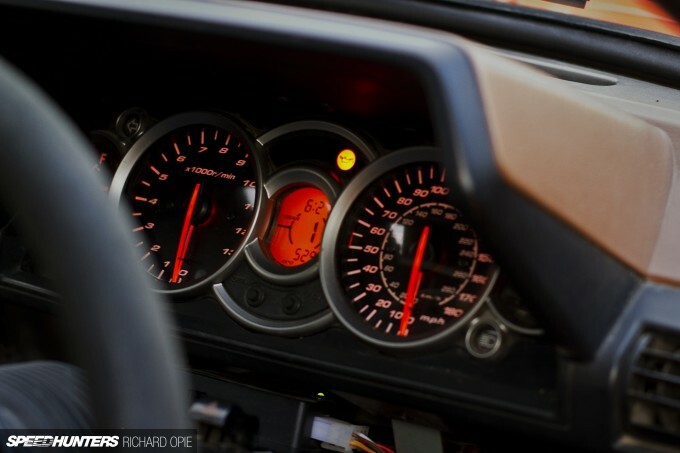 Inside, visual cues to the origin of the powerplant include the integration of the Hayabusa dash to the KP61 binnacle, with functional gear indicator, speedo and of course the all-important 13,000rpm tacho! 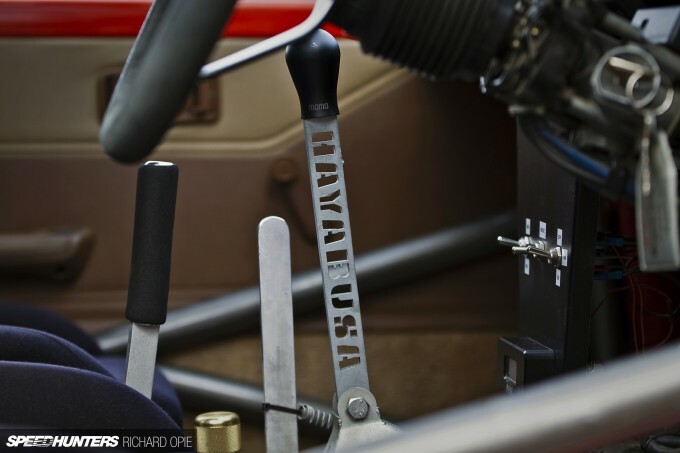 Shifting the stock Hayabusa sequential transmission is taken care of with yet another bespoke piece of gear – the Flatshifter Expert unit allowing full throttle up-shifts and blip on down-shift. Reversing is the domain of a Roadstercycle reverse unit, operating independently of the main gearbox via a fabricated driveshaft from where the Hayabusa would normally feature the front sprocket. Ensuring occupant safety, the gunmetal interior is adorned with a 6-point rollcage incorporating solid side impact protection essential for closed-road events. 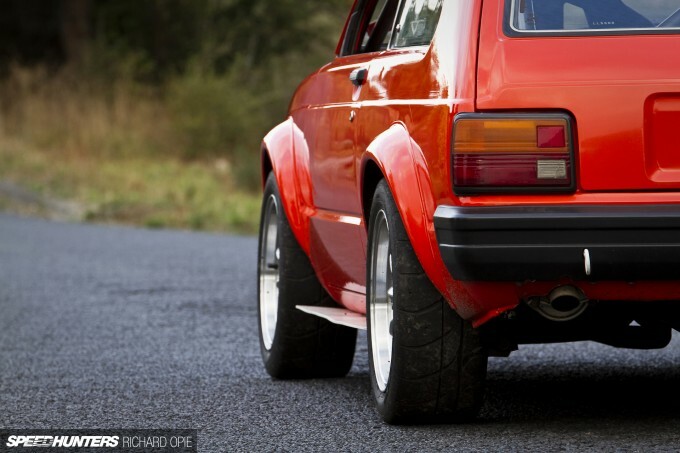 Once again, this a product of Kevin’s extensive experience in racecar engineering with the added benefit of stiffening the typically-flexible 1980s Toyota platform. 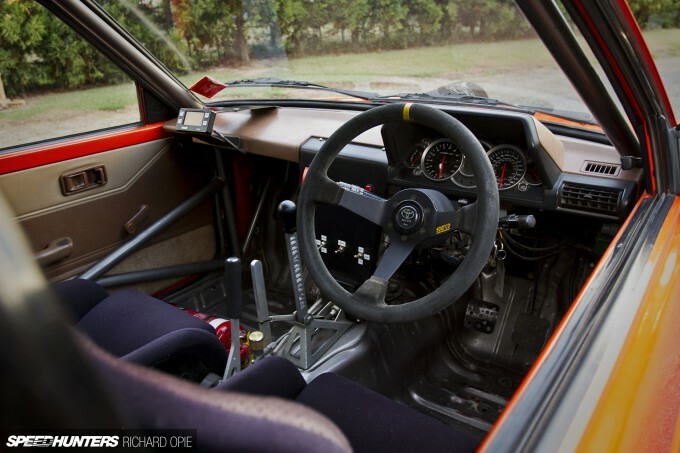 The spartan interior, stripped for weight loss, features a suede Sparco R345 steering wheel with the obligatory yellow band at 12 o’clock, ensuring Kevin and Michael are able to accurately point the KP in the direction of the nearest corner amongst an 11,000rpm cacophony. 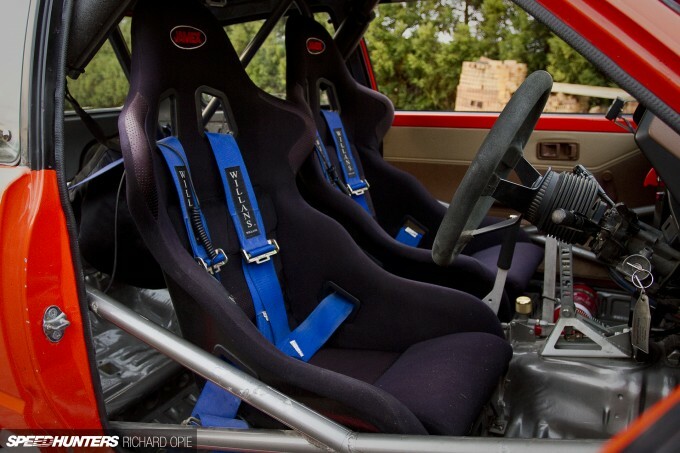 Jamex fixed-back bucket seats offer support to the driver and co-driver well in excess of that afforded by original Toyota offerings, while quality Willans 4-point harnesses keep the crew strapped in solidly. 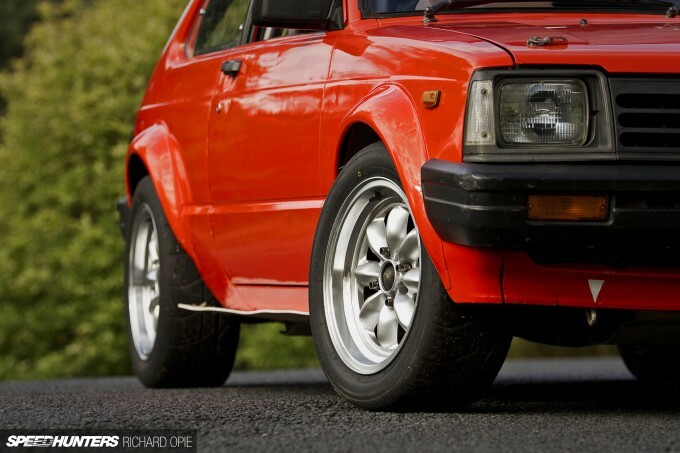 In order to maintain a flat cornering stance the Starlet employs a strikingly simple suspension arrangement. 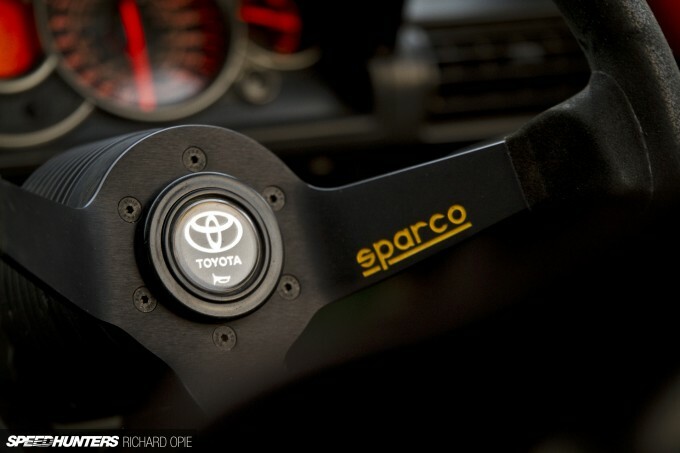 The factory-style setup remains, with the original swaybar (which also acts as the castor arms) modified to allow up to 7 degrees castor. 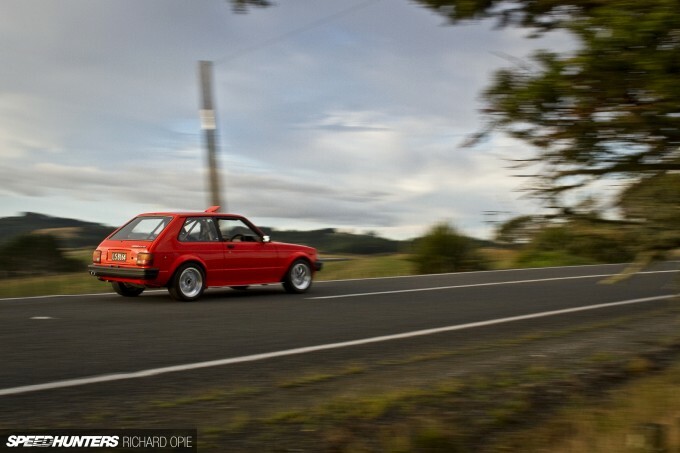 Rose-jointed factory LCAs locate beneath a set of 15mm roll center adjusters, which keep bump-steer to a minimum as the modified Bilstein-equipped Toyota Cressida struts deal with the humps, ruts and undulations typical of New Zealand hillclimb competition. The Toyota parts bin also came to the party with larger vented Cressida discs and calipers providing additional stopping power. Up the back, once again things are kept simple. The standard KP61 triangulated 4-link setup remains, albeit attached to a larger 6.7-inch T-code axle sourced from an AE86 that transfers the torque to the road via a 3.55:1 ratio TRD limited slip center. Adjustable spring platforms ensure height and swapping of spring rates is kept fuss free. 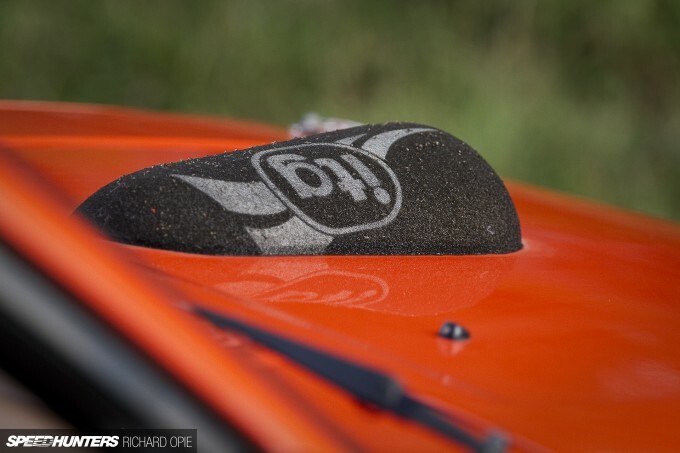 Maintaining a tidy, classic appearance is of utmost importance to Kevin – although not the prettiest of additions, installed along the sills of the car are a pair of stoneguards which serve to keep the orange paintwork free of stonechips. 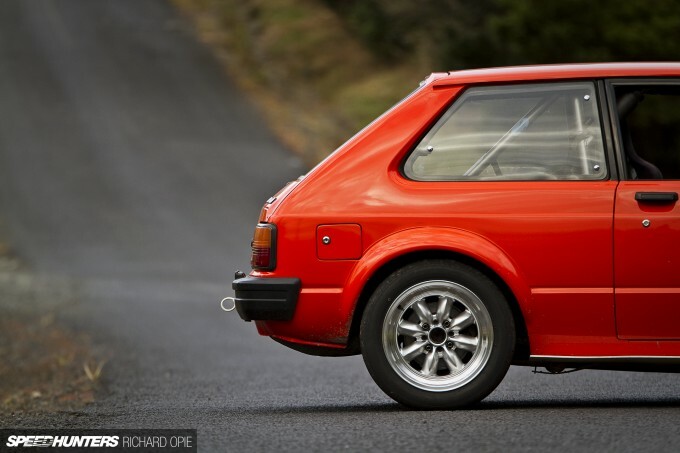 Rolling stock is a set of classic Minilite-style 15×8-inch wheels, in this case fitted with Nitto NT01 semi slicks for tarmac usage, swapped out in favour of 14-inch Enkei rally wheels wrapped in Pirelli gravel tyres for rallysprint duties. 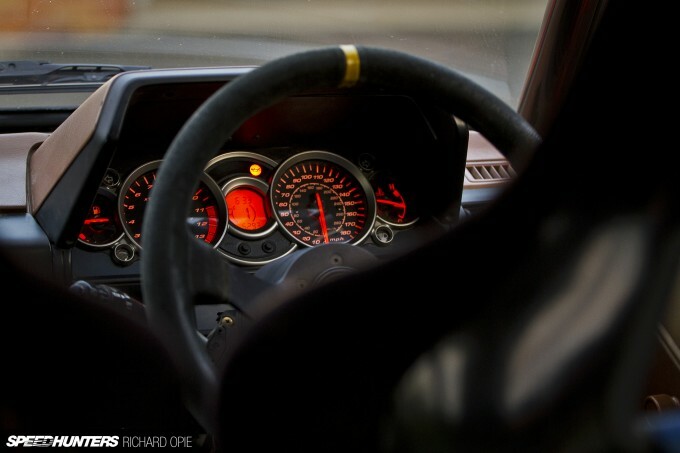 When I first started talking to Kevin about the car, he explained the ethos behind the build has always been about maximising performance and reliability, with a special emphasis on investing in the right areas to ensure the car will run hard, and continue to run hard for a long duration. Over the 14 months the car has been completed, Kevin and Michael have clocked up more than 1,000 competition kilometres over 22 events. 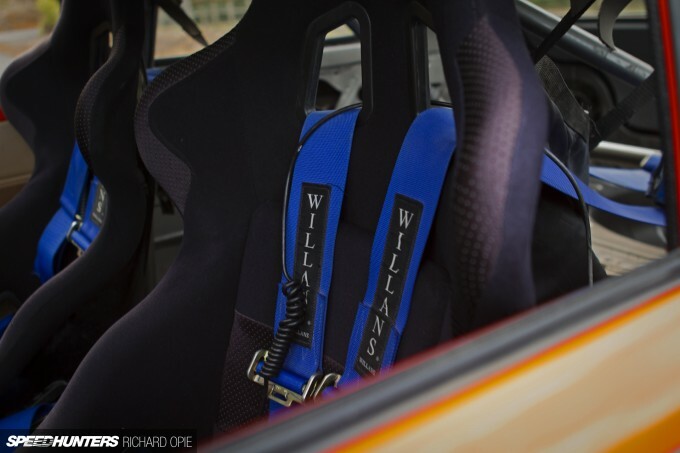 In his own words, they’re “ecstatic with both performance and reliability” and eagerly look forward to running the car at future events across the region. 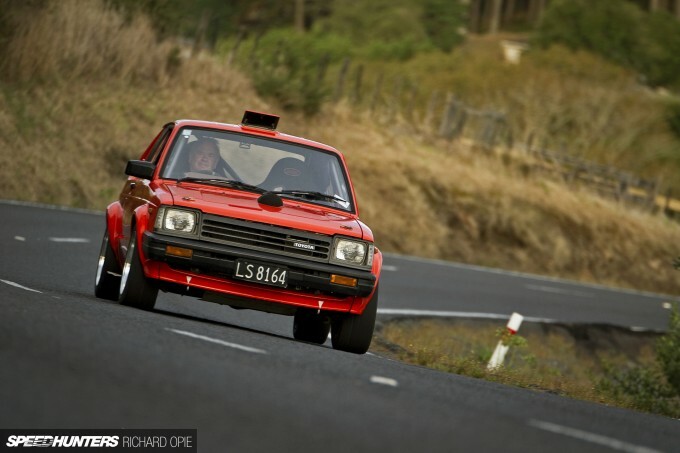 On that note, I’ll leave you with this in-car clip of Kevin hammering the Starlet through the gears at a tarmac hillclimb event last year. Like your kiwi starlets? Check this one..
Wow, that's an awesome build! 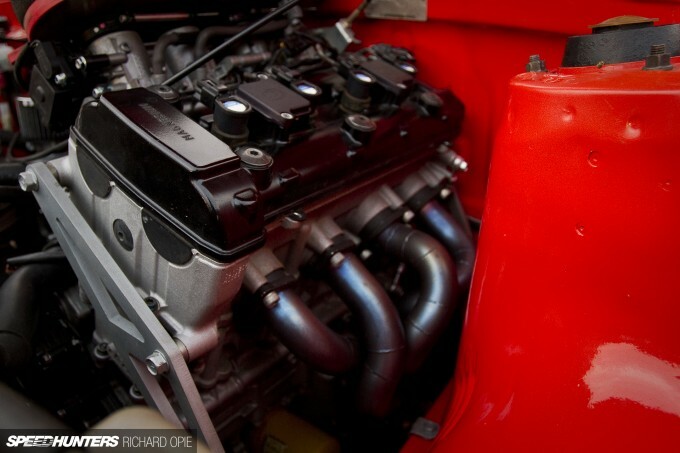 Perfect engine type for that size car. engine to sort of regain all the power loss in howling the extra weight? This car is bloody quick. Raced against it a lot and kevin and son can certainly drive. So, so good. The video at the end was a nice reward too. Really Awesome Pics, Thanks for sharing. Kevs2579 Cheers Kevin, looking forward to a passenger run still!!! Paddy McGrath Add a bank of spotlights and voila! 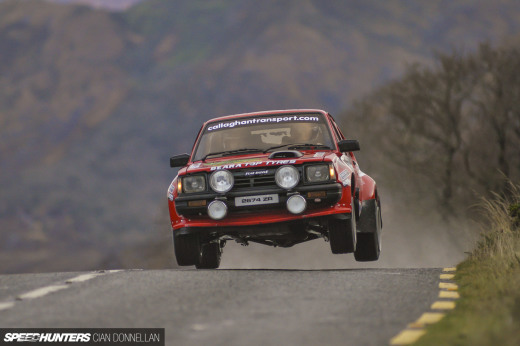 Hayabusa powered Irish-spec KP61! RussClarke The videos definitely give you that impression.... 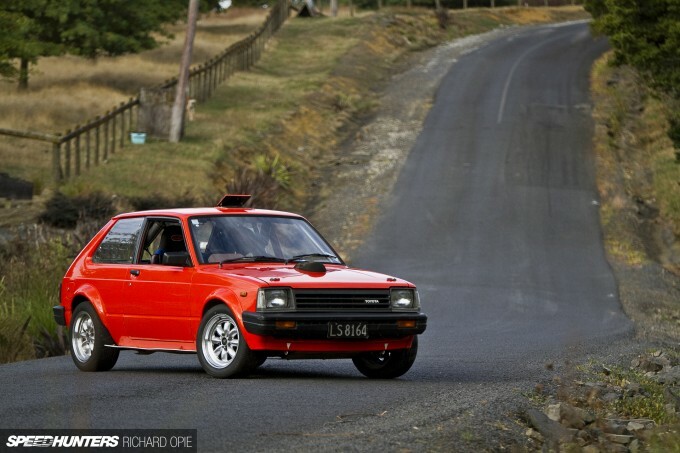 I first encountered this car at a Port Waikato hillclimb in 2011 (which claimed a large number of cars in pretty spectacular fashion) when it was still 5K powered, and was impressed at the pace then! It's shifted up a level or 3 now! Oompa Where can I find some more info on this car? I've seen snippets of it but never managed to encounter it in the metal and would love to! musgravecycles What plans have you got for yours? 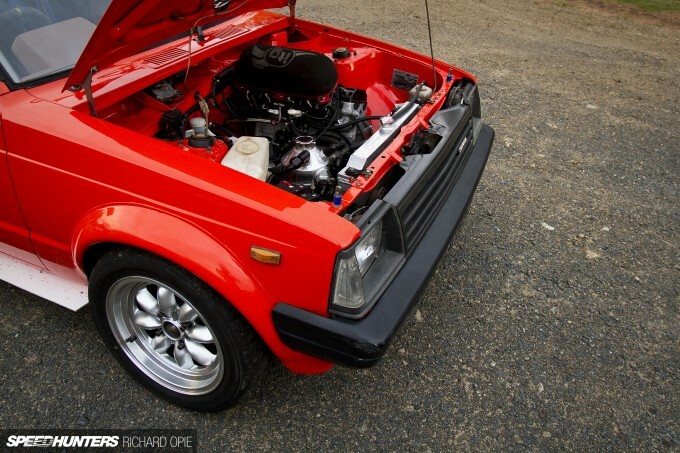 I'm a serial KP Starlet fiend with one in the build myself, so I've got a pretty keen interest in the little Toyota chassis! kphillips9936 It's impressive all right. And not as complex as you might think... definitely a bonus sticking to a Keep It Simple ethos when it comes to going quick, and having fun! trying to buy all the missing parts outright. Maybe you'll find a feature here on SH in 10 years when it's done...lol. What have you got in the works for yours? Turns up at the odd track day, but try asking on his You tube channel. SnoozinRichy RussClarke I know I was at the same event. A Subaru came off the worst, one hell of a crash. Kevin's son even took me out in the car and even then it was a lesson in how to drive. Hello sir!! 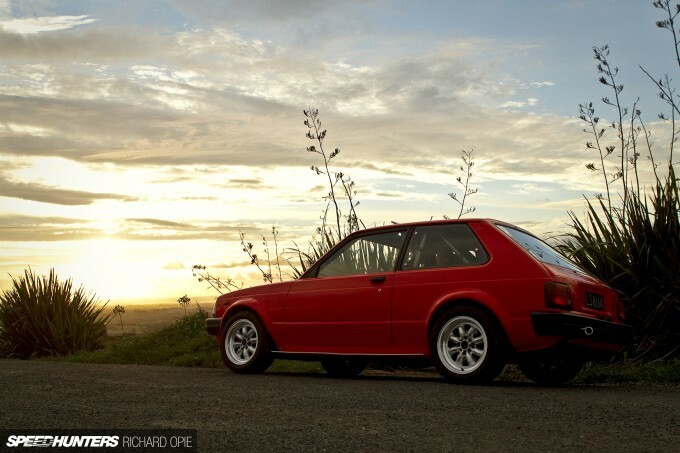 I have a kp61 here in the states and want to do the same to mine!! How can I get in direct contact with you? ?